Thursday night was a concert by Toumani Diabaté and his Symmetric Orchestra at the Somerville Theatre, organized by the World Music organization, via which we have seen many excellent concerts. 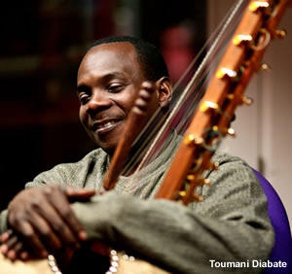 Toumani Diabaté is a master of the kora, a West African instrument with 21 strings, somewhere between a lute and a harp. During the concert he demonstrated how it is played, using only the thumbs and forefingers of each hands. One thumb lays down the bass, while the other plucks out a melody. Over that foundation, Diabaté spins wild, flowing flights of improvisation with his two forefingers. "You can play it fast, or you can play it slow," he said. No, Toumani - you can. Diabaté himself is from Mali (I have written about Malian music here before), but his band features musicians from all over West Africa. It is a fusion band, mixing traditional African instruments with rock and roll drums, guitars, and horns or keyboards. Diabaté explained that his goal is to bring the centuries-old traditions of West Africa to life with modern sounds, and also to transport today's music back in time. He said it more eloquently than that; I wish I could recall his exact words. The high point of the show for me was its middle segment, in which Diabaté introduced each of the traditional instruments and gave each of his virtuosic bandmates a solo chance to show off. There was a man who played the balafon, a relative of the marimba or xylophone with wooden bars over gourd resonators. Diabaté's balafon-player actually had two balafons one behind the other, tuned differently so that instead of only the pentatonic scale of traditional West African music, he had access to most of the chromatic scale. During his solo, he burst cheerfully into Dave Brubeck's "Take Five," as if to say - you're listening to our music, and we are listening to yours as well. Perhaps the most entertaining of Diabaté's soloists was the djembe player, a big strong, man who beat the stuffing out of his drum and while dancing and grooving and generally looking like he was having a fabulous time. There was also a ngoni (also known as xalam), a small lute-like instrument that Diabaté's bandmate played with incredible agility. The keyboard player took a turn on a traditional wooden flute as well. When the band all jammed together, the sound was driving and intense. There were two singers who sang their hearts out and the drummer and bass player set down a powerful rock beat. Diabaté's fusion sound really works. He takes ample advantage of the synergistic similarity between the traditional African pentatonic scale and the American blues scale, creating tunes that drift seamlessly across oceans and centuries.